Welcome to Saint Stephen the Martyr Catholic Chapel and Campus Ministry! Welcome! Saint Stephen the Martyr Catholic Chapel is the Catholic campus ministry center for the University of Alabama at Birmingham (UAB), Samford University, Birmingham-Southern College, and other colleges in the Birmingham area. Whether you are a grad student or a new freshmen, a faculty member or an alumni family, we encourage each other in our roles as Catholic Christians in contemporary society, and we seek to grow as young adults into happy marriages, fulfilling vocations and calling, meaningful work, and heavenly virtues. The Chapel will be open Monday through Friday 9:00 AM to 9:00 PM in addition to the following times for liturgy in order to provide more time for personal prayer and meditation. 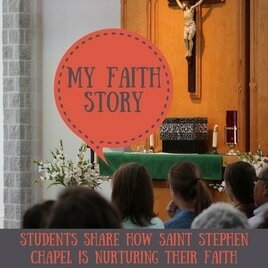 St. Stephen's is celebrating twenty-five years this year! Click the link below to learn more about what this year has in store. Sunday: 10:00 a.m. and 5:00 p.m.
​Tuesday, Thursday, and Friday: 12:30 p.m.